Pyrénées-Orientales (English: Eastern Pyrenees; Catalan: Pirineus Orientals; Occitan: Pirenèus Orientals) is a department in the region of Occitanie in southern France; it is next to the northern Spanish border and the Mediterranean Sea. The department is formed by the historically Catalan-speaking area of Rosillon (with its different parts: Roussillon (modern), Haute Cerdagne (or simply Cerdagne), Conflent, Vallespir and Capcir) and Fenouillèdes, an historically Occitan-speaking area. Before 1659, most of the present department was part of the former Principality of Catalonia, within the Kingdom of Spain, so historically most of it has been Catalan-speaking, and it is still sometimes referred to as Northern Catalonia. Pyrénées-Orientales was created in 1790 during the French Revolution, when the whole of France was divided into departments, replacing the old provinces. Pyrénées-Orientales was formed by the province of Roussillon and Fenouillèdes (Occitan: Fenolheda), a small piece of territory which had formerly been on the southern edge of Languedoc. Pyrénées-Orientales has an area of 4,116 km2 (1,589 sq mi). It has the department of Aude to the north, the Mediterranean Sea to the east, Spain to the south, and Andorra and the department of Ariège to the west. The department is dominated by the Pyrenees mountain range. The highest mountain is Pic Carlit () that is 2,921 m (9,583 ft) high. The best known mountain in the department is Le Canigou () that is 2,784 m (9,134 ft) high. There are three main rivers in the department: from north to south, Agly, Têt (the largest river of the department) and Tech; the Agly has its source in the Corbières hills, in the southern part of the Aude department. The other two river has their sources in the Pyrenees. The three rivers flow into the eastern Plain of Roussillon before they flow into the Mediterranean Sea. 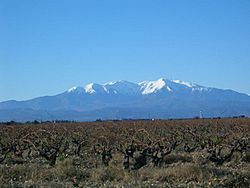 Most of the population and agricultural production are concentrated in the Plain of Roussillon, with only 30% of the area. Llívia is a town of Cerdanya, province of Girona, Catalonia, Spain, that forms a Spanish exclave surrounded by French territory. The département is managed by the General Council of the Pyrénées-Orientales in Perpignan. The Pyrénées-Orientales is part of the region of Occitanie. The area is traditionally divided into comarques, of which five (French Cerdagne, Capcir, Conflent, Roussillon and Vallespir) are historically Catalan-speaking and one (Fenouillèdes) is historically Occitan-speaking. 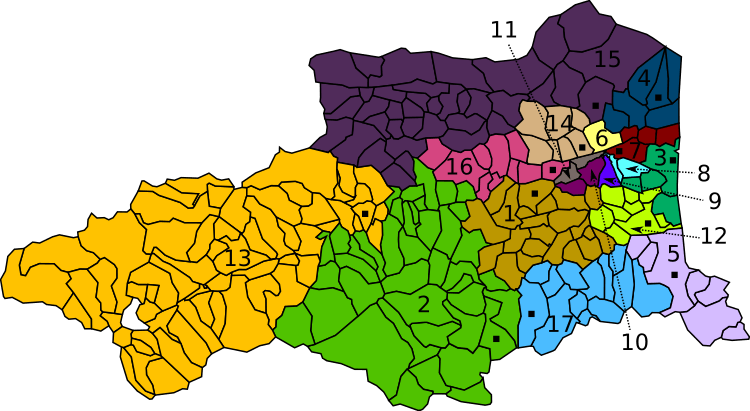 There are 3 arrondissements (districts), 17 cantons and 226 communes (municipalities) in the Pyrénées-Orientales. Pyrénées-Orientales has a population, in 2012, of 457,793, for a population density of 111.2 inhabitants/km2. The arrondissement of Perpignan, with 342,661 inhabitants, is by far the largest. The other two, Ceret and Prades, have respectively 72,338 and 42,794 inhabitants. The only important city is Perpignan with 120,489 people living there in 2012. Other cities are Canet-en-Roussillon (12,602), Saint-Estève (11,362), Saint-Cyprien (10,552) and Argeles-sur-Mer (9,901). The inhabitants of Pyrénées-Orientales are known, in French, as Pyrénaliens (women: Pyrénaliennes) or Catalans (women: Catalanes). French is spoken by almost all the population. Minority languages in the region are Catalan and Occitan, which between them are estimated to be spoken by rather more than a quarter of the population and understood by more than 40%. On 10 December 2007, the General Council of the Pyrénées-Orientales recognized Catalan as a regional language of the department, though French is still the only official language in France, according to the Constitution. Csa - Mediterranean climate with hot summers. Cfa - Subtropical humid climate with hot summers. Cfb - Oceanic climate with template summers. 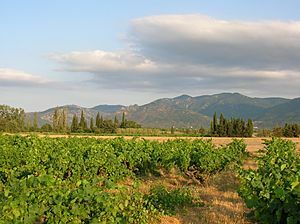 Pyrénées-Orientales is a wine-growing area and a tourist destination. The area is famous for its wine with the predominately red grape varieties grown all over the department. Prades (Catalan: Prada de Conflent) - site of the Catalan Summer University (Universitat Catalana d'Estiu). Banyuls-sur-Mer (Catalan Banyuls de la Marenda) famous for its wines. Prats de Molló - important defensive castle of the 17th century facing south to the Pyrenees. Salses - important defensive castle of the 16th century, on the ancient frontier with Spain. Pyrénées-Orientales Facts for Kids. Kiddle Encyclopedia.